We use eye drops for a multitude of reasons: to lubricate dry, tired eyes, to alleviate itching and burning from allergies, to treat conjunctivitis (AKA: “pink eye”), for routine care following eye surgery and to treat chronic eye diseases such as glaucoma. No matter the reason, there is a proper way to use eye drops to make sure you get the most out of them. Here at Mandel Vision, we’re committed to your eye health. To that end, we stay on top of the latest technology and trends in both laser vision correction and medical ophthalmology. Whenever we come across something new or noteworthy, we try to share that knowledge with our patients. In today’s video, we’d like to share a simple technique to help you get the most benefit from your eye drops. This technique should be used when instilling all eye drops whether they are being used for an infection, for chronic dryness, or for routine treatment after LASIK and PRK laser vision correction. Before you instill an eye drop, keep your eye open and suppress blinking for 4-6 seconds before putting a drop in. This will allow the tear film to break up, or evaporate, which gives the drop better access to a larger portion of the ocular surface. Your tear film has three layers: The outer layer is the oily layer and it keeps your tears from evaporating too quickly so you get the full benefit from your eye’s natural tears. The watery layer, which is the middle layer and the most abundant, makes up most of our tears. The bottom layer, which is the mucous layer, is closest to the cornea. This layer helps your tears spread evenly across the cornea. By allowing your natural tears to evaporate, it prevents the drop from being diluted and allows more of the drop to reach the eye so that you get a better benefit from the eye drop. Wash your hands. The eye drop inside the bottle is a sterile solution and you want to keep it that way to guard against infection. Read the label. Check the bottle to make sure you picked up an eye drop, and the specific eye drop you meant to use. You’d be surprised how many patients mistake an ear drop for an eye drop and only find out after they’ve used it in their eye (ouch!). Check the expiration date. Eye drops should never be used past the expiration date. Some lose their efficacy beyond this date. It’s also recommended that all medication be discarded 30 days after opening, even if it hasn’t reached its expiration date. Be careful not to contaminate the dropper. This means don’t let anything touch the dropper – including your eyelids and eyelashes. This is another way to guard against infection. Suppress blinking for 4-6 seconds. See above. Instill drop. After suppressing your blinking for 4-6 seconds as recommended above by Dr. Mandel, lean your head back and pull down the lower eyelid to create a ‘pocket’ for the eye drop. Place an eye drop inside that pocket of your lower eyelid while being careful not to touch the tip of the bottle to your hair, skin, eyelids or eyelashes. Some patients find it helpful to look in a mirror while doing this. If you are not sure that the first drop went in, it’s fine to give yourself another drop. It’s better that you get two eye drops, than none at all. Close your eye. Close your eye for 4-6 seconds. (Don’t blink.) This ensures that a portion of the eye drop doesn’t evaporate so that you get the full effect of the drop. Cap the bottle tightly. This is the final step in helping to guard against infection. Lastly, don’t share eye drops with others. 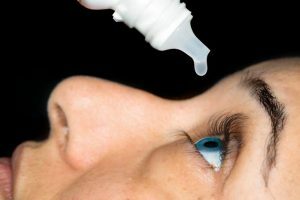 We hope these tips on the proper use of eye drops is helpful and that you get the full benefit of your eye drops from now on! This entry was posted in Blog and tagged Eye Health Tips. Bookmark the permalink.